And yet, battery life remains an increasingly cumbersome struggle that the military. As American soldiers become increasingly reliant on technology, they demand more power sources. One dependable option is the standard Ultralife UBI-2590 battery, pictured below. Weighing over 1.3 kilos a piece, these brick-sized devices can power anything from a radio to an antenna to a smartphone. But since the batteries have a limited capacity, soldiers need more than just one for a mission. They might need a few dozen. After all, there aren’t many sockets for recharging in the mountains of Afghanistan. At first, a propane-powered generator might not seem like such a game-changing innovation. But consider our recon soldiers camped out in far flung locations, transmitting potentially life-saving intelligence while struggling to evade detection. Once they’re out of battery power, the soldiers can’t do their job. Firing up a gasoline-powered generator would give away their position, and dropping more batteries into the area risks lives. So these soldiers lug in as many charged batteries as they think they’ll need—sometimes adding nearly a 45 kilos to their already heavy load of gear. 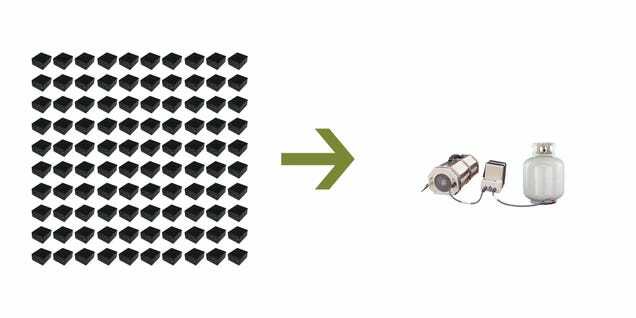 Bear in mind the simple, brutal fact that each of those 100 batteries weighs over 1.3 kilos. The propane generator weighs just five kilos, and the tank weighs an extra nine. Smaller two kilo tanks work just as well. Effectively, DARPA wants to replace dozens of kilos of gear in a soldier’s pack with just a smidge of propane. It sounds like an ambitious but simple goal, one that could save lives. Now if they could juuuuuuuuust figure out how to turn fatigues into a giant solar cell, nobody would have to carry any power sources at all.